There is no move too big or too small for Move 4 Less. We beat other Movers in Knoxville prices by up to 40%. As knowledgeable Knoxville movers, we know how to move and handle the most heavy, delicate and expensive items including antiques. Our Movers are experts at packing, loading, unloading, disassembling, and reassembling furniture. Like most other professional Movers in Knoxville, we are licensed and insured; but what set us apart from other moving companies is our low prices and high quality of moving services. 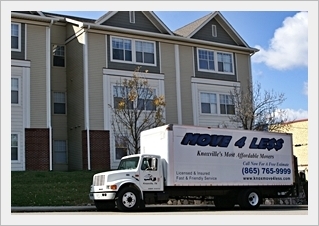 Our movers in Knoxville are guaranteed to be effective – so you can count on a fast, safe, and efficient move. We promise that you will be impressed with our superior and affordable services. Just see what our past customers have said. There is no move too big or too small for Move 4 Less. We perform small jobs that other Knoxville moving companies will not, such as moving a piano from room to room or helping for a few hours to load or unload a rental truck. Just like other movers in Knoxville we are aware that our customers look for great service at great prices and that is precisely what we deliver. We are the most affordable Movers in Knoxville and that’s why so many people each year choose Move 4 Less! Here are some reasons why our movers in Knoxville are a the best option. When it comes to time savings, our movers will not. Rest assured that your getting the best deal with Move 4 Less. Move 4 less is an outstanding Knoxville moving company because we provide the best services to you at the most affordable prices, feel free to compare us to other movers in Knoxville. We will match or beat the prices of any licensed and insured movers in Knoxville. Are you considering renting a truck and doing it yourself? Move 4 Less is comparable in price to moving yourself with a rental truck, but saves you the hassles of getting a truck, paying for fuel, and inconveniencing your friends and family. 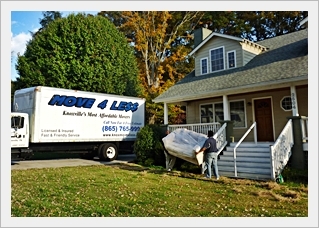 If you’re moving in Knoxville, let us do all the hard work and heavy lifting! Using a professional mover reduces the risk of damage to your personal belongings and home. Our Movers in Knoxville utilize professional packing methods which results in fewer damages. We can free up your valuable time and allows you to focus your energy on more important things, like getting ready for your house warming party! Moving should be fun, not stressful. Let Move 4 Less take the stress out of it! Move 4 Less is fully licensed and insured, and complies with all insurance requirements as mandated by the Tennessee Department of State Business services (Check TN.gov or TN Secretary of State). Some movers in Knoxville and Tennessee moving companies more generally maintain minimum levels of insurance, if any. We offer more than $2,000,000.00 in coverage to protect your house, apartment, or business at no extra cost to you. Rest assured that you’re in safe hands with Move 4 Less.